February 14, 2018 (Redmond, WA) – B.E. 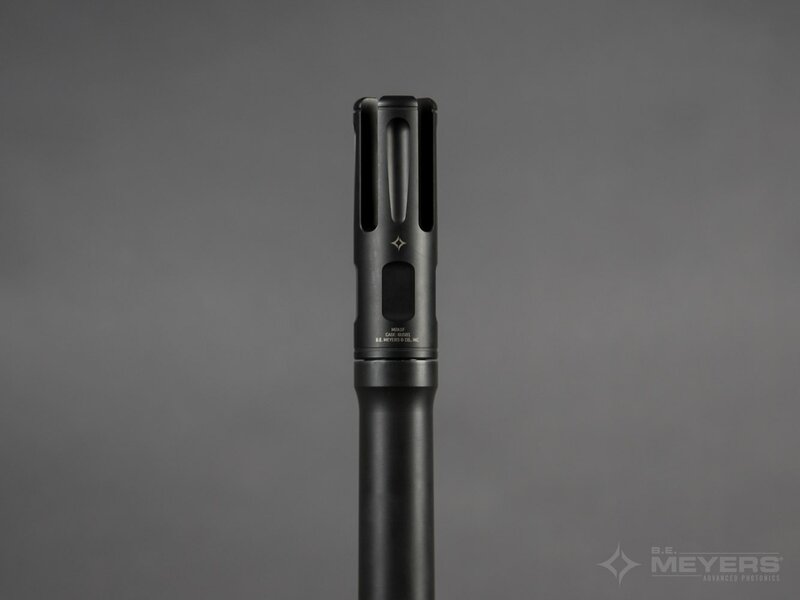 Meyers & Co., Inc. is pleased to announce the release of the M2A1F Flash Hider, developed in response to requests for a more durable flash suppression solution for the M2A1. Leveraging patented flash suppression design, the M2A1F preserves the superior performance and durability that the warfighter has come to expect from B.E. Meyers & Co., Inc. products. The M2A1F is made from a specifically selected alloy that has been heat treated to provide increased durability, and reliability over current competitive devices. Its left-hand thread pitch allows for quick and easy installation, and eliminates risk of separation from the barrel by self-tightening as shots are fired. The M2A1F is a truly compact M2A1 flash hider. Measuring in at only 4.625″ long, the M2A1F represents only a small increase in overall length of the weapon platform when compared to other legacy M2 variants, and does not negatively affect the cyclic rate of the short recoil M2 system. The M2A1F’s patented open-tine design is internally serrated to diminish visible signature in both day and night engagements. The effectiveness of the M2A1F’s flash suppression supports uninterrupted use with night vision devices, eliminating momentary blindness and flash distortion. B.E. Meyers & Co. is ready to equip users currently fielding the M2A1 HMG. The M2A1F is a superior solution for those looking for rugged, compact, and effective flash suppression, and can be easily fitted without any additional modifications to the weapon. With the B.E. Meyers M2A1F, the durable materials and design reduces risk of failure, improving confidence of reliability in all adverse conditions. ABOUT B.E. MEYERS & CO., INC.
B.E. Meyers & Co., Inc. is a family owned business that prides itself on serving the needs of the warfighter with passion, ingenuity, and innovation. They design, engineer, and manufacture optoelectronic and defense solutions for the U.S. and her allies, specifically for those who are forward in the fight, both today and into the future. The company’s core capabilities include visible, IR, and SWIR laser systems for pointing, illuminating, and Hail and Warning. These technologies are integrated onto various platforms including: crew served weapons, individual weapons, and fixed/rotary wing aircraft. Customers include all branches of the U.S. Military; Federal, State, and local law enforcement agencies; foreign defense and security organizations; and defense contractors worldwide. Established in 1974, B.E. Meyers & Co., Inc. is an ISO 9001:2008-certified manufacturer of optoelectronic devices. Its business offices, engineering, and manufacturing operations are located in Redmond, Washington. For more information about B.E. Meyers & Co., Inc. and their products visit www.bemeyers.com.